Successfully Added 1/3 Inch CMOS Wireless Baby Monitor - 380TVL 3.5 Inch LCD Screen, 2 Way Audio, Temperature Readings, Music Player to your Shopping Cart. Communicating over a wireless 2.4GHz connection with up to 300 meters range, this baby monitor gives you the freedom to move around the house while monitoring the sleep of your little one, all without disturbing them from slumber land. The Digital RF modulation with frequency hopping ensures a secure network so you won’t be picking up or transmitting to the whole neighborhood. The 5 meter night vision allows the camera to be placed out of reach from curious hands but remain within range for easy detailed viewing without needing any lights on in the room. With a 1/3 inch CMOS sensor the camera can detect everything that's happening and you can see it all clearly on the 3.5 inch LCD screen of the receiver unit. 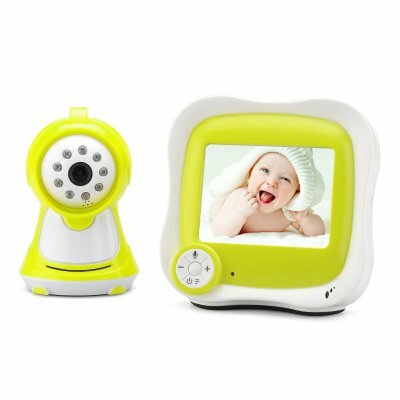 This baby monitor system allows for up to 4 cameras to be connected at the same time letting you can track what’s happening in different bedrooms, ideal if you have multiple children or a second on the way. 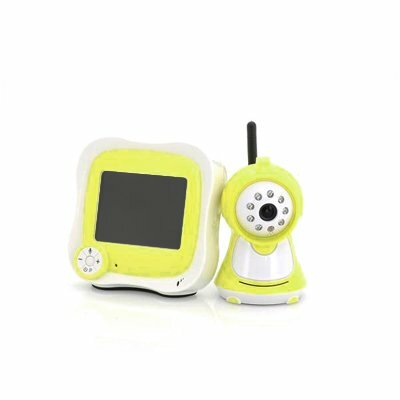 The two way audio lets you hear if your child is distressed and you can calm them with a soothing voice so it’s good for reassuring them to sleep without you in the same room. You can even play music through this system to help them relax and nod off at night and with a temperature monitor you can check the room is at a comfortable temperature so they don't get too hot or cold in the night. This product is in stock now, we guarantee next working day shipping and offer a 12 months warranty on all our products. Brought to you by the leader in electronic devices and wholesale Baby Monitors, Chinavasion.